Ideally playback time of each music track file is listed. Problem arises when we want to know total playback time of all music files in a specific folder or drive partition. One way is to manually calculate total play time by adding playback time of each music track contained in a folder. More easy and automated way is using Play Time utility. Play Time is a free and portable software utility (does not require installation). It has neat interface displaying the required total playback time of all music tracks in a selected folder. 1. Download Play Time utilty. After download, unzip to extract contents. Then double click Play Time icon to launch the program utility on your computer. 2. Now click on Add Folder icon and then select folder containing music files or tracks. All the music files will be listed automatically in utility window. Once you load music files from on folder, you can append to add more files from different folders. If you want to start fresh, click Clear list button at bottom right side. 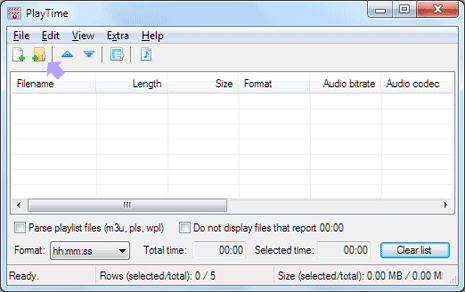 Small but very useful utility for users wanting to know total playback time of specific number of music track files contained in folder(s).